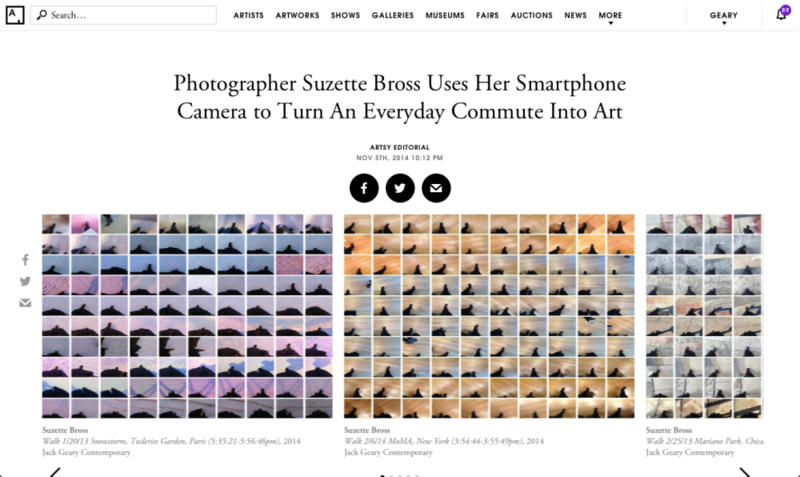 Photographer Suzette Bross captures everyday movement in her new series “Walks,” which goes on debut at Jack Geary Contemporary this month. Aiming to elevate the mundane, Bross has created a series of ephemeral gridded photographs that document moments from her daily commute, making the quotidian seem vibrant. Using multiple, controlled images from a sequence, which are assembled in tiled compositions, Bross’s works animate the fluctuations of motion, creating a sense of movement. The photographs, which were all taken at waist-level with her smartphone camera pointing toward the ground, expose the ways in which the mind is able to ruminate as we wait in a check-out line or walk around the neighborhood. Bross chose to use the smartphone camera as her medium because of its grainy quality, which creates a kind of distorted perspective similar to one you would experience while briskly traveling. For the series, she walked through places such as MoMA in New York, the Brooklyn Museum, Division Street and Mariano Park in Chicago, and the Tuileries during a snowstorm in Paris. Recalling the photographs of Eadweard Muybridge, Bross’s works are enigmatic and dreamlike, revealing the profundity in the ordinary and deconstructing the chronology of movement. The works capture the rhythm of her walks and also manipulate textures present in the images, creating patterns from floor tiles, shadows, and footprints. “Walks” also interrogates how the individual creates his or her own path through dense urban spaces, in a sense authoring their own journey. The series builds on Bross’s previous series “Commute,” which was taken with a point-and-shoot camera and documented water towers, roadways, chain link fences, street signs, and other common roadside scenes that typically go unnoticed, similarly exposing the deep contemplation that occurs during these everyday journeys. Bross will explore the universality of this experience by leading an hour-long walk for twelve visitors on November 8th, inviting the group to use their own smartphones or digital cameras to capture the patterns and compositions of the streets surrounding the gallery. “Walks” is on view at Jack Geary Contemporary, New York, Nov. 7–Dec. 6, 2014.